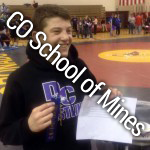 Robert Gambrell - CO Mines - Purler Wrestling Inc.
Continental League – Athlete of the Month – February 2015 – Awarded to Athlete of All Winter Sports, of All Schools in the league. 3rd Place – Dec. 19-20 2014 Warrior Classic, Grand Junction, CO. lost 1 match, 32 man bracket. 6th Place – The Rockwell Rumble, Orem, Utah Jan. 16-17 2015, 64 man bracket. 71 teams from 6 states. Purler Dream Season – 14 Day intensive camp, 2013 Junior year.